A member of the Trio Anka since 2012, Kağan Korad started his professional concert career with the well-known guitar ensemble Bilkent Guitar Trio, and continued both as soloist and ensemble player. He studied guitar first with Ahmet Kanneci and continued with Ireneusz Strachocky at Bilkent School of Music. 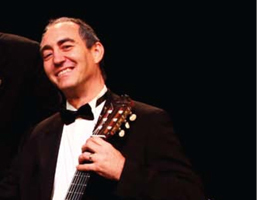 In 1987, he co-founded the Bilkent Guitar Trio, and later Terci-Korad Guitar Duo with Kürşad Terci in 2000. He has toured throughout Turkey, as well as Europe, Asia, and Africa, giving over 500 concerts with his ensembles and as a soloist. He has performed in many international guitar festivals, including Koblenz, Volos, Guitart, and Naxos. Both Bilkent Guitar Trio and Terci-Korad Duo performed many world premieres, some of which dedicated to them. Kağan Korad has also made quite a few arrangements for orchestra and two guitars, as well as solo, duo, and trio guitars. In 2000, he recorded with Bilkent Guitar Trio under the label of Kalan Music and his duo CD was released by A.K. Music. He also recorded for the Guita Art Festival CD in Belgrade in 2003 and “Gitarla Bulusma” album of CAGSAV music. Currently, he teaches guitar at Bilkent University College of Music and Performing Arts. He also serves as the Chair of Music Department and the Dean of the College.